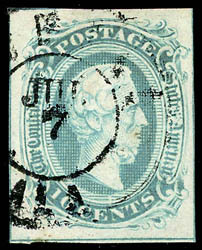 Confederacy, 1863, 10¢ blue, "frame lines", showing full framelines at top and bottom and partial framelines at sides, faint pre-use vertical crease, tied by light "Winchester, Va., Jun 20" cds on adversity cover made from printed military form, to Lexington, Ga.; cover with couple tiny cover edge tears at bottom, Very Fine, a very scarce use on an adversity cover. Scott No. 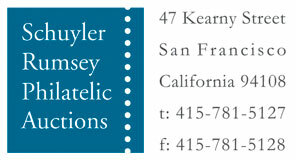 10 Estimate $1,500 - 2,000. 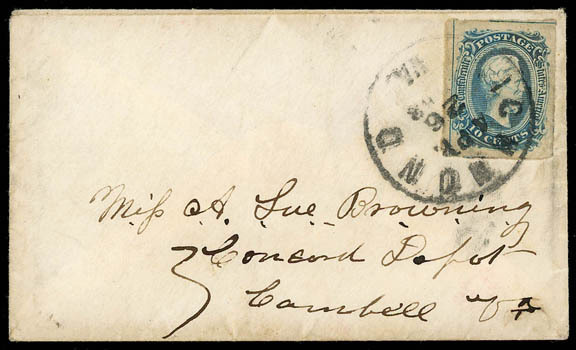 Confederacy, 1863, 10¢ blue, "frame lines", showing full frameline at top and most of framelines at sides, deep color, neatly tied by "Milledgeville, Ga., Apr 28" cds on small 1863 cover to Col. Charles Omstead, 1st Ga. Vol. 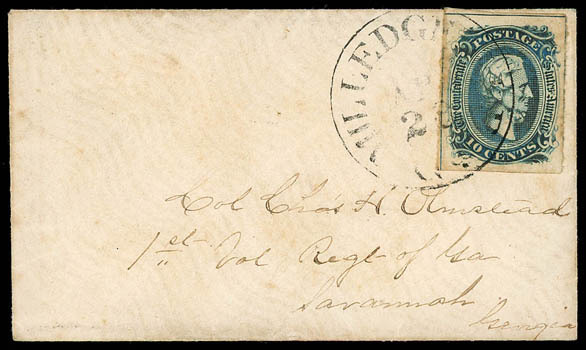 in Savannah, Ga., Very Fine, an early First Month of Usage cover with the earliest known use being April 19, 1863, ex-Dietz. Scott No. 10; $3,250 Estimate $1,500 - 2,000. 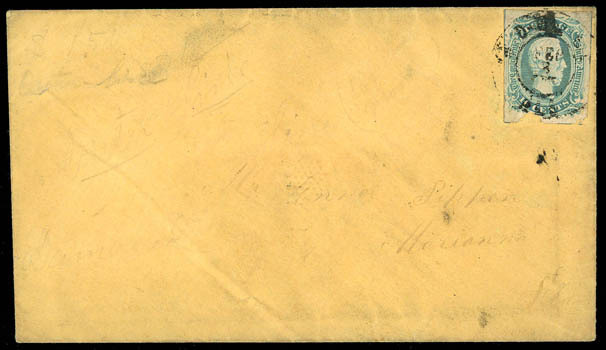 Confederacy, 1863, 10¢ blue, "frame lines", showing full frameline at left and partials at other sides, tied by "Richmond, Va., Apr 26, 1863" cds on cover to Concord Depot, Va., Very Fine, an early First Month of Usage cover with the earliest known use being April 19, 1863. Scott No. 10; $3,250 Estimate $1,000 - 1,500. 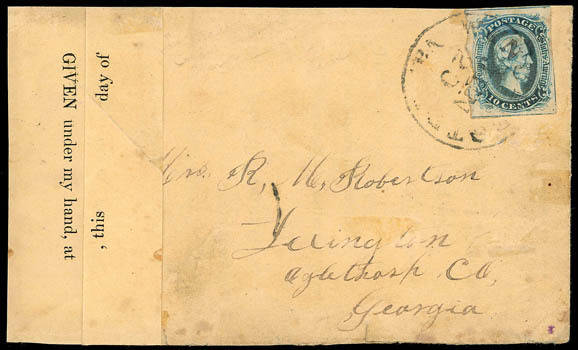 Confederacy, 1863, 10¢ blue, "frame lines", margins showing framelines on three sides, missing portions of stamp at bottom, tied by "Mobile, Ala." double-circle datestamp on cover to Marianna Fla., Fine; with 1999 C.S.A. certificate.